The Waynesville vs Joplin game scheduled for today was canceled due to the services for Waynesville’s Patrick Clegg. A make up date will be announced soon. The game-winning goal was scored by Hannah Winkel with 5 minutes left, assisted by Emily Boyer. The Yellowjackets accomplished step one in their effort to return to the District Final’s for the 3rd straight year. Thursday’s game against Camdenton will be the next test, while Jeff City looks to get past Rolla and Waynesville next week. The Lakers went up 5-0 in the first half before Parkview scored a goal in the 38th minute. Junior Latea LaRue scored 3 goals and had 2 assists in the contest. Freshman forward Kaylay Utley scored 1 goal and had 4 assists. Freshman Cassie Hale scored 1 goal and had 1 assist. Sophomore Sabrina Bartley, Junior Jessica Smith and Senior Stephanie Kirvan each had a goal as well. Camdenton is now 14-3 overall and 4-1 in Ozark Conference play. Jeni Frewin (2G), Emily Jordan (1G), Lindsey Sprouse (2G), Emily Cline (1G), Karis Hefton (1G), Ann Millington (1G), Molly Brewer (2A), Katie Brewer (1A) scored for the Falcon’s. Goals for Hillcrest were scored by Elizabeth Durnall on an assist by Erin Boschen and Courtney Busby on an assist by Boschen. Great game tonite in Marshfield! Catholic takes a 2-0 lead at halftime on goals by Jessica Bowman and Rachel Herron. Marshfield ties the game early in the second on goals by Dannyca Mostrom and Kylea Ryser. Catholic gets the game winner late on a goal by Natalie Smid. Goals from Megan Gunnels, Eva Shwert, and Jackie Wacha. On Senior night. Branson scored fifteen minutes into the match when Neva Raschel’s free kick went off the crossbar and was headed in by Emily Joplin. The score held until stoppage time in the first half when Ali Appleby broke free and beat Bri Ford to tie the score going into half. Both teams moved the ball in the second half but Jordan Gattis got the game winner with a nice header back to the far post in 63rd minute. Branson continued to pressure and got its third goal from Maggie Charland off a one time hit in the 79th minute. The win was the first ever Central Ozark Conference win for the Branson Pirates. Congrats ladies! Branson improved to 4-11-1 with the win. The Liberators knocked off their Central Ozark foes with a goal by freshman Sara Magana (28), who leaped into the air near the penalty spot to meet Jonna Welch’s (excellent cross from the right side, nodding it into the net beyond the reach of the keeper. Beautiful goal, scored in the 77th minute, to negate a comeback by the Eagles from a 4-2 halftime deficit. Both teams are very athletic and committed, it was a lively game that saw the attack go back and forth throughout the match. 2-2 only 20 minutes into the game, Bolivar went on to score two more to gain the early advantage. A shot by Jonna Welch from the right side just outside the box somehow fell under the cross bar, and a throw-in by Julie Magana (23), done via the flip and near the endline, worked to perfection as she put it to the near upper corner where it was easily knocked in when the keeper was unable to handle the hard throw. Both teams came out hard in the 2nd half but it was the Eagles that began to put together the passes necessary to maintain possession and create opportunities for themselves. The first came from the penalty spot, following a foul in the box. Taken confidently by Kelsey Haist, it energized the Eagles further and they continued the attack. The 4th goal was a beauty, nodded into the net at the far post by (18) from Haist’s cross near the right endline. Haist got to the spot by picking up an attempted clearance and then battling through 3 defenders, pushing the ball past a second attempt to stop her in the box, and then delivering the quality ball. Bolivar’s goals were scored by Jody McFarlen (PK), Hannah Harris, Julie Magana, Jonna Welch, and the game winner in the 75th minute by Sarah Magana. Bolivar and Nixa both have teams prepared to compete. The Liberators just want to go forward, and have the youth and energy to do that all night. Nixa appears poised to join Glendale, Kickapoo, Ozark and Catholic as a program that wants to move the ball on the ground and create goals. When they spread the field tonight, they were able to do just that. Bolivar’s pressure, and some early season injuries, meant they weren’t able to get the job done in the time available to them tonight. I’m looking forward to seeing both teams several more times with the playoffs only a month away now. Goals by Jae Stephens, Erin O’Keefe, and Sammi Graham. Arielle Santillian 2 assists, Sarah Onstot first ever shutout. Janessa, a fourth grader in the Mt Home (AR) school district is a big soccer fan. She’s battling cancer and goes to Little Rock every 2 weeks for chemo but wanted to see a game. 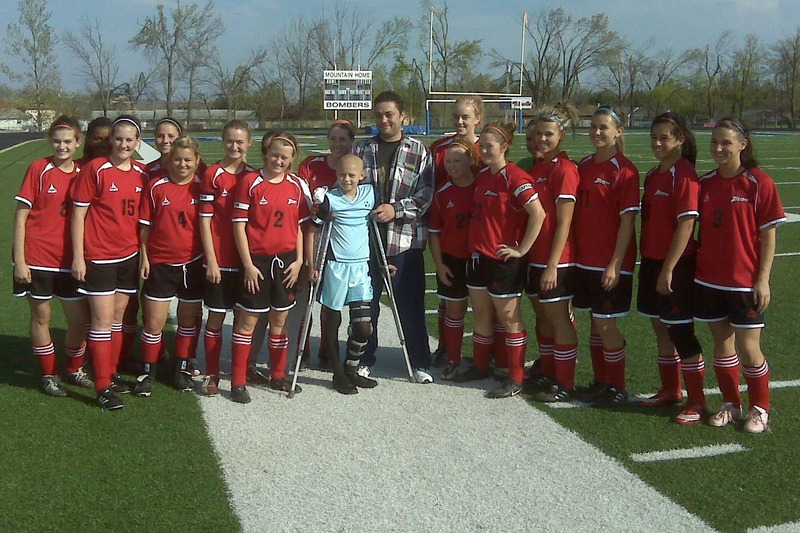 The good weather meant today was the day – Janessa was an honorary captain and the team presented her a signed ball. The Zizzer’s offered a jersey signed by all the players (pictured) as well. Janessa handled the the coin toss (we lost the toss and mtn home deferred and let us have the choice anyway – good sportsmanship). It was a big night for Janessa and a nice win for the Bombers. Alix Opfer (2G/1A), Molly Brewer (1G/1A), Emily Cline (1G/1A), Lindsey Sprouse (1G/1A), Jeni Frewin (1G/1A), Mindy Moffe (1G), Erica Torgeson (1G), Emilee Williams (1A), Karis Hefton (1A). The first goal of the match game from Shelby Stewart on a shot from distance that snuck in, giving the Vikings a 1-0 lead. Later in the first half Melanie Allen crossed a great ball to Jessica Maerz who was running on and struck the ball into the corner netting for a 2-0 lead that the Vikings took into halftime. Stewart scored again in the 2nd, from Loderhose, while Maerz completed the scoring on an assist from Stewart. Website story. Joplin was outshot 14-6, according to its stats, and Eagle freshman Casee Wheeler had nine saves. Joplin falls to 3-7. The Jays got goals from Jennifer McArthur and Kylea Ryser while winning at home against COC and District foe LogRog. The Wildcats continue their winning ways in District 12 while the teams establish a new rivalry to match the boys per the Neosho Daily News. In the 20th minute, Shelby Murray notched yet another goal when she got a cross pass from Melanie White. That, essentially, was the entire game. The Chiefs controlled much of the game tonight, keeping the ball in the Yellowjackets defensive end. In the 14th minute Marin Gelshiemer scored from about 40 feet on a strong shot that went just under the crossbar and over the keepers hands. Half time 1-0 lead for the Chiefs. The score remained 1-0 until, in stoppage time, Katie Lynn pushed a ball through a crowd of players providing the final margin of victory for the Chiefs. The Zizzer’s kept it close for a half, down 0-2 before the Falcon’s offense opened up in the 2nd half. Emily Cline (3G/1A), Jeni Frewin (2G/1A), Molly Brewer (2G/1A), Lindsey Sprouse (1G/1A), Alix Opfer (1G), Emily Jordan (1A), Katie Brewer (1A). The Tigers website has the details in Tigers Pillage the Pirates. The Tigers move to 10-3-0 on the season. Sophomore Sarah Humphrey and junior Kelsey Whittet both scored in the second half for the Bruins (3-4). 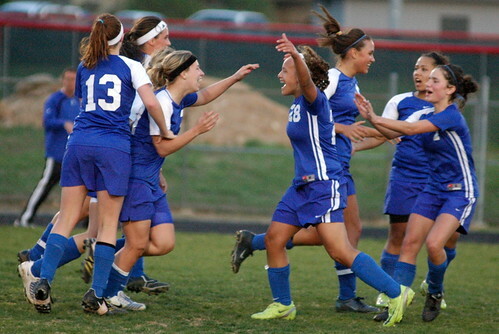 Nearly five minutes after the Bruins’ second goal, Kinsey Shouse scored for Jefferson City (2-7) on a penalty kick. Marc VanDover replaced three-year varsity coach Kelly Gates as head Coach of the Bruins, who resigned Friday. Rock Bridge Athletic Director Jennifer Mast said Gates left for personal reasons. The Missourian offers details on the team. Camdenton goals were scored by junior Latea LaRue, sophomore Ashley Paschel, freshman Kayla Utley and freshman Cassie Hale. Sandra Shore was in goal for her fourth shutout of the season. Senior Stephanie Kirvan, junior Jessica Smith and Utley all had an assist in the match. The Catholic girls defeated their COC rival 2-0 on goals from Andrea Parker in the 8th minute and Shelby Hatz in the 18th minute. Rachel Herron assisted on Parker’s goal and Parker assisted Hatz. 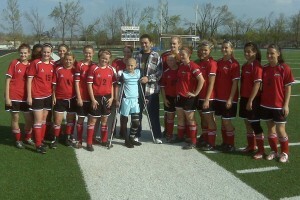 Tune in to KSPR Thursday night for Bolivar goalkeeper Sara Scott as Wendy’s High School Athlete of the Week. In a rematch of last years quarterfinal, won 3-1 by the Crusaders, the teams met in cold and wet conditions at Hickman High School where things warmed up quickly. St Dominics is the defending state champions and returned the majority of their squad from the previous year while Springfield Catholic brought their freshman heavy line up. From reports received, the quality of the game was high and it was the second half before the Crusaders were able to break the deadlock. In a game delayed an hour to remove standing water from the pitch, it was the Red Knights who matched the power of the thunderstorm that preceded the game. The Falcon’s applied all of their skill and effort to the match but this game served as a reminder of the distance yet to go before Southwest Missouri soccer will be able to challenge for a High School title. The Red Knights feature a squad that includes six Division I recruits in the starting 11 today, including a pair of players who recently represented Missouri in the National ODP Tournament (#2, Kelley Gravlin and #16, Sarah Doggendorf). Add #3 Blake Miller and #5 Drea Barklage (pictured in red) who won a National Title as U15’s and the size of the challenge faced by the Falcons (and Chiefs last year) becomes apparent. The game-winner was scored in the 25th minute by #4, Kristine Vogt, who was waiting in the six yard box when Miller somehow not only ran down a ball in the right corner but was able to turn on it and send it sliding into the box. 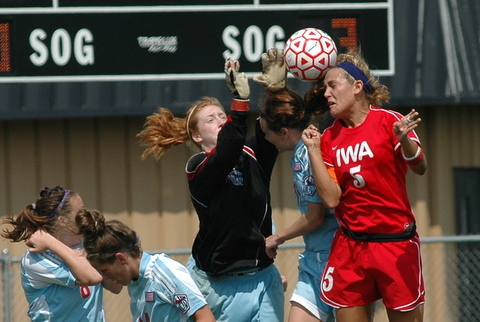 Vogt redirected it between the charging GK and defender and the Red Knights had the margin they would need. Vogt got a second goal in the 31st when she received a throw-in near the top of the 18 yard box and was able to turn and send a ball to the far post, just inside the upright. The second half began with Miller once again imposing herself on the game. In the 46th minute, she created a throw-in deep in the right corner. The ball was received by Katie Impierale and pushed to Miller who ran from the end line towards her own goal with the ball. She turned and sent a cross to the far side, just outside the six yard box, where #13 Alex Baer confidently headed it into the upper corner for a 3-0 lead. Miller scored in the 52nd minute when she picked up a loose ball near midfield, made a run down the middle and as three defenders closed on her, let loose a shot from 28 yards out that went into the upper right hand corner. The final goal was scored by Kelley Gravlin on a shot from just inside the box. The Red Knights advance to the semifinal where they will face off against St Teresa Academy at 8:00 pm Friday in Fenton. They’ll be out scouting tonight’s quarterfinal match between Nerinx Hall and St Joseph as well as Hazelwood Central vs Francis Howell North.